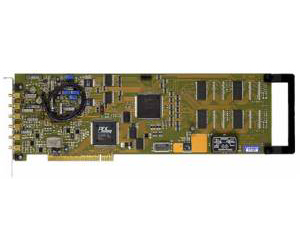 The UF258 ultra-fast digitizer board provides an 8-bit A/D measurement resolution and maximum sampling rate of 400 MS/s. The board has 2 analog input channels, each with a 200 MS/s A/D converter. For single channel measurements, the two A/D converters operate in a ping-pong mode to achieve the maximum 400 MS/s sampling rate. In two-channel operation, each channel can record up to 200 MS/s.